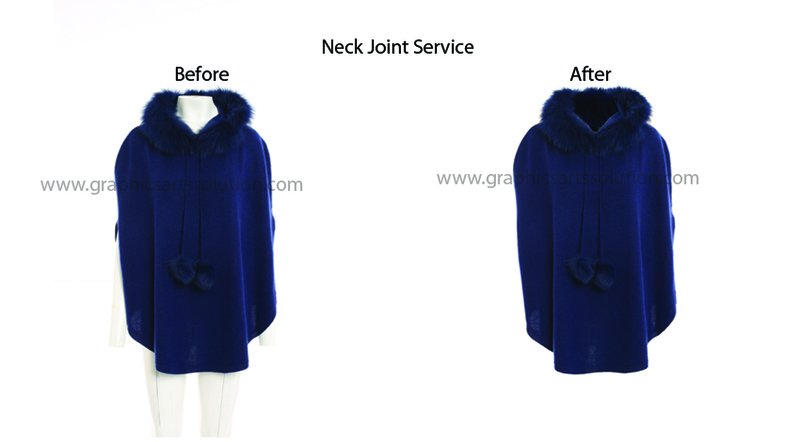 Neck joint is a very ingenious photo manipulation service for garments product .It is commonly known as ghost mannequin or invisible mannequin service. This service are generally used to make the product inner side seen and to diverge the mannequin from the photo and take another picture of products inner side. As the ghost mannequin service inflict people to see both the outside and inside of clothing at the same time it is commonly more preferable to displaying the clothes on a live model .We serve neck joint or mannequin removal services with professional designers who are experienced for many years. Nowadays ,Neck joint Service is very essential for garment industry owners, Magazine business owners or professional photographers. Most of the company are use Neck joint service to improve their business. Ghost mannequin service is the best option to showcase your clothing because when photographers take photos of a cloth wearing it on a mannequin, at that time the inner part of the cloth remains unseen. our experts show the full view utilizing Photoshop tools by connecting the neck part & making a ghost part attached with the color of garments. Online base fashion House is appeared day by day, for this reason it’s needed urgently to attract the customers trough display products online or on posters. We are involved with many online shopping mall, buying house, and textile & garments factory of all over the world. Any type of garments cloth such as t-shirts, lady t-shirts, shirts, coats, women skirt, sweater, children cloth, work wear, polo shirts, party dress, jackets, girl jackets, sport t-shirt, and all sort of available products which are necessary to reinstate and edit imagery to its extensive border. Our expert team keep up exactness on each image neck joint. On every image we work on we assure that we edit it strictly. to perform ghost Our skilled professionals always try to new method, Technique and Update software for image editing and keep their eyes active on color match, size match to make the image more attractive and realistic after the total procedure is done. We preserve the solidity of your original design and shape so that the completed products look as natural that nobody will realize that the ghost part is created by someone.